The Features tab allows you to select features for vehicles, as well as manage SiriusXM for vehicles. The Features tab will display all of the Standard Features and Optional Features available for your vehicle decoded from the VIN, along with any custom features uploaded from DeskManager or that you have added manually. There are two checkboxes for each option: one in purple, which controls whether the feature is displayed in your listings; and one in green which controls whether the feature is displayed on the window sticker. Clicking on the feature text will check or uncheck both boxes, or you can click on each box individually. To add additional features that weren’t decoded by the VIN, or if the VIN was unable to be decoded, select first whether the feature should be a Standard or Optional feature, and then select a Category to add the feature to. Enter the Feature description, and click on Add. Click Save Changes when you are done adding custom features to add them to the vehicle. Any custom features you have added will be displayed in a dark red text, and can be deleted by clicking on the X next to the feature. If you do not want the vehicle features to be displayed in your auction and Craigslist listings, uncheck the Enabled box next to Display in Listings. If you have SiriusXM Integration enabled and this vehicle is a 2005 or newer model year passenger vehicle, additional SiriusXM data will be displayed here. First, you will see which events have been reported to SiriusXM. Vehicle data is only be reported to SiriusXM for vehicles which have a valid ESN. The Radio Demo cannot be activated until SiriusXM processes your inventory data. Vehicle Sales are reported to SiriusXM when the Sale Status is Unpaid or Final, a Sale Date has been entered, and Buyer Details have been entered. Vehicle Sales must be reported to SiriusXM to extend a Free Trial to the buyer. If a sale is cancelled, this is also reported to SiriusXM so you can sell the vehicle again to a different buyer. 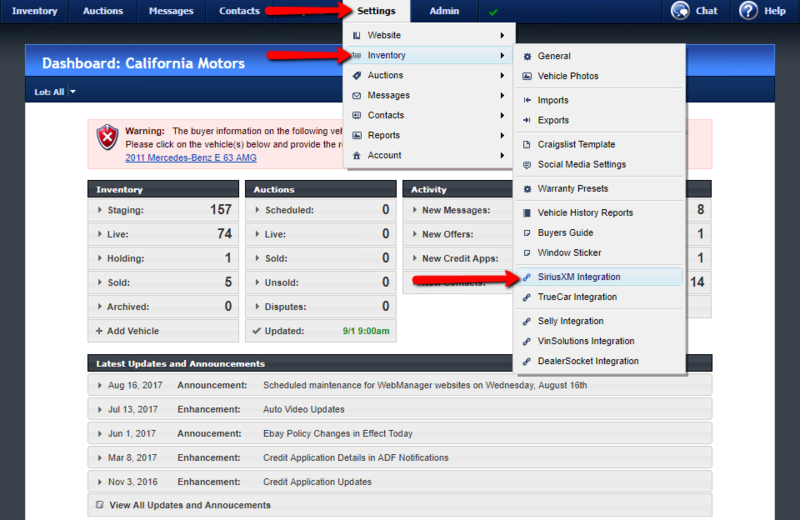 If the option to Automatically get SiriusXM ESN when vehicles are added to inventory is checked in Settings -> Inventory -> SiriusXM Integration, WebManager will automatically look up the Radio ESN for you as vehicles are added to your inventory, whether they are added manually, uploaded from DeskManager, or imported from a third party. 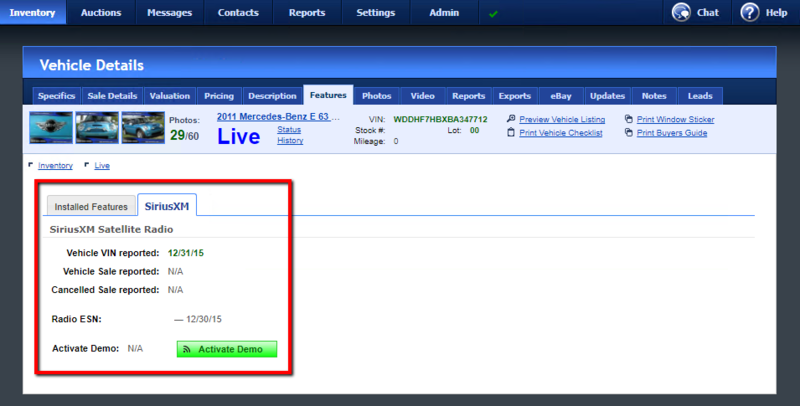 If you do not have this option enabled, you can click Get ESN on vehicles that you want to look up the ESN for. If this vehicle has a valid ESN it will be displayed here. If no ESN could be found for the vehicle, it will display Not Valid instead. Before activating the SiriusXM Radio Demo, a vehicle must have a valid ESN, and the vehicle data must be submitted to SiriusXM. Click Activate Demo to send the radio activation signal to the vehicle’s radio. In order for your radio to receive the signal, park the vehicle outside with an unobstructed view of the sky and tune the radio to channel 184 for Sirius radios, or channel 1 for XM or SiriusXM radios. It may take several minutes before the activation signal is processed and sent to your radio. Do not adjust your radio during this process. If you do not receive service within 5 minutes, call SiriusXM Dealer Support at 1-800-852-9696.